I’ve got pretty good, I think, at making sure the family eats well. Meal planning, combined with cooking way more than we need at weekends to stock the freezer with homemade ready meals, has been my saving grace. However I’m not always so great at feeding myself on the days when I’m in the office. I am making a conscious effort to put that right though. Breakfast is a case in point. On the three days a week I commute up to Bristol (set to rise to four in the new year), I leave the house just after 7am and I’m generally guilty of heading out without eating breakfast and grabbing something on the way, or worse, going without until lunchtime. But I’ve been saved. I was sent some of these single-serving packs of buckwheat and rice muesli from Eat Natural, the people behind those lovely, wholesome snack bars. They’re perfect for me; I can keep a stash in my desk drawer and enjoy a bowlful of tasty gluten-free muesli, chock-full of mixed seeds and dried fruit, while I wait for my PC to boot up and the coffee to brew. And I’m getting better with my lunches too. It’s all too easy to get stuck into a boring-sandwich-rut when you take a packed lunch into work, particularly as I’m based in a fairly soulless business park with a severe lack of tempting foodie offerings close by. (Although that’s probably a blessing for my finances.) With a little forward planning, I’ve been coming up with some slightly more interesting lunches, giving me something to look forward to during a morning of meetings and catching up with emails. 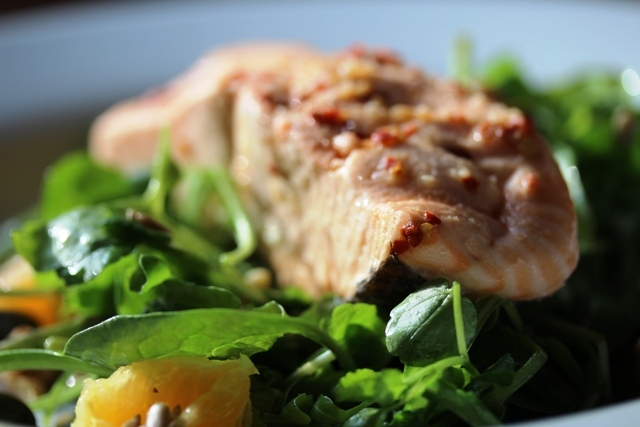 This quick and easy salmon salad is one of my current favourites. 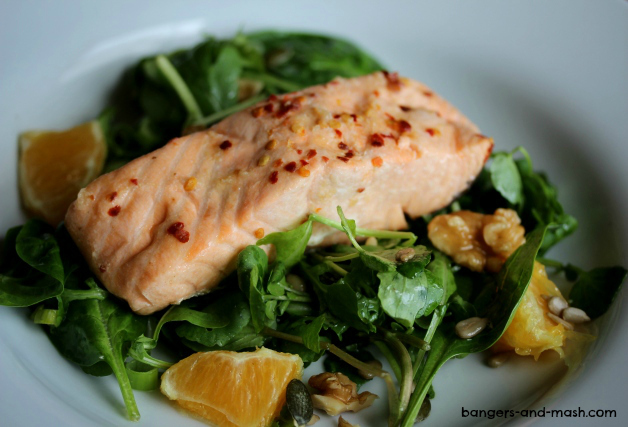 The night before, I simply bake the salmon in foil with a few dried chilli flakes, lemon, garlic and ginger and bung some salad in my lunchbox with a scattering of nuts, seeds and orange segments. Next morning, all there is to do before I head out is chuck some dressing on the salad, top with the cold salmon and I’m good to go. It most definitely beats a cheese and chutney roll from the sandwich trolley. Place the salmon fillet on a large sheet of tin foil. Add the chilli, garlic, ginger and lemon juice, and wrap loosely in the foil. 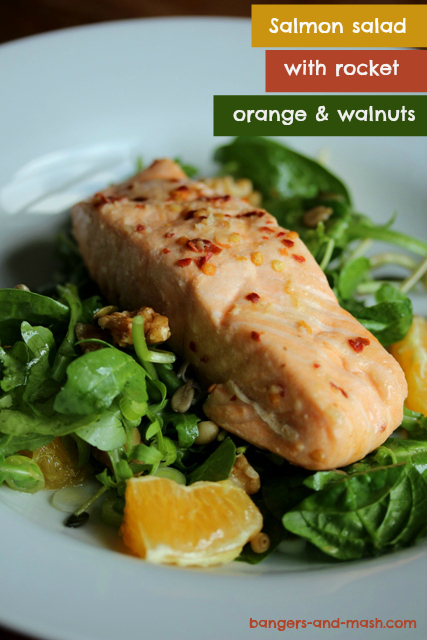 While the salmon is cooking, throw the rocket salad in your lunch box, along with the orange segments, walnuts and mixed seeds. Pop on the lid and place in the fridge. When the salmon is cooked, chill in the fridge, still in the foil, until morning. Just before you run out of the house next day, pour the oil and vinegar onto your salad, slide in the salmon fillet, season and fly out of the house. Only a few hours ’til lunchtime! Disclosure: I received complimentary samples of Eat Natural buckwheat muesli. No money exchanged hands and all opinions expressed are my own. 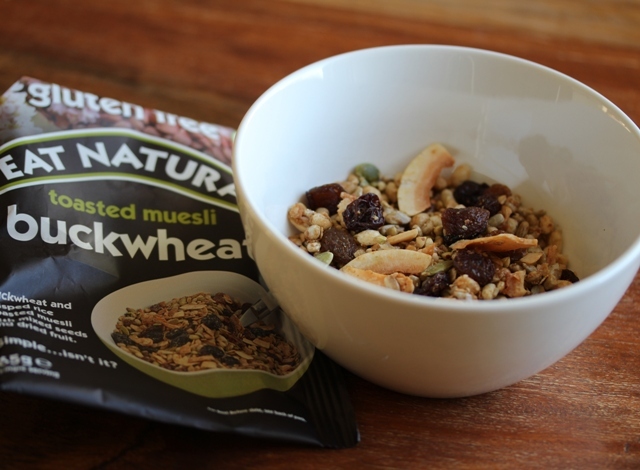 Single-serving packs of buckwheat and rice muesli from Eat Natural are available in Tesco stores, priced at just 79p. That looks delicious. I too am trying to make sure I eat well. I spend a lot of time making sure my family eat well but often forget myself 🙂 I’m getting quite good at using leftovers for lunch and I always try and make sure I eat a healthy breakfast/brunch. Having something in the fridge to look forward to for lunch after a mornings work is such a simple treat! Thanks Sarah. Yes, leftovers are also perfect for lunch next day. I also like to make up big batches of soup at the weekend and freeze them in single serving portions – great for heating up in the microwave at work for a warming hug in a mug! I don’t have kids but I love to have healthy meals so I often cook extra for dinner so that I have a good lunch the next day. A bit of extra protein cooked dinner goes great on top of a bed of salad greens for lunch the next day. Couldn’t agree more. I love leftover meat and fish next day with salad for an easy lunch.